This past year has been absolutely incredible. It's been a year of new adventures and new friendships, a year of learning and growth. I've been listening to my heart more and more through this whole food blogging thing, trying to synthesize my love of food with my passion for building deeper understanding and appreciation between world cultures. 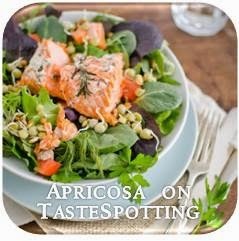 I'm so thankful for having you join me here at Apricosa, following my heartfelt joy in the Italian and German flavors of my heritage and cheering me on (or simply tolerating, heh) my growing excitement for Korean and Chinese food. I love sharing these things, and I feel so grateful for you, your kind words and encouragement. The end of the year is always a time of reflection for me, and it is also a time full of celebration. Celebration of what has been and of what is to come. Then there is Advent, Christmas, and New Year's on our family calendar, as well as a good number of birthdays! When it comes to making the birthday cakes, that project generally falls to me, and it is a lot of fun to brainstorm with the birthday "child," get inspiration from their preferences, and make those cake wishes a reality. For my brother's birthday, he asked if he could have some sort of cake with fruit. Being that his birthday falls at the end of December, we don't have too many fresh fruits around here other than apples and citrus. Neither of us were really clicking with those options, but then I remembered that some friends of the family had gifted us over the summer with pounds and pounds of exquisite peaches and plums from their farm, and we'd frozen them down to enjoy over the winter. I kept thinking about our beloved German-style sahnetortes, and when I came across a recipe for peach melba cake, my cake plan began to form. 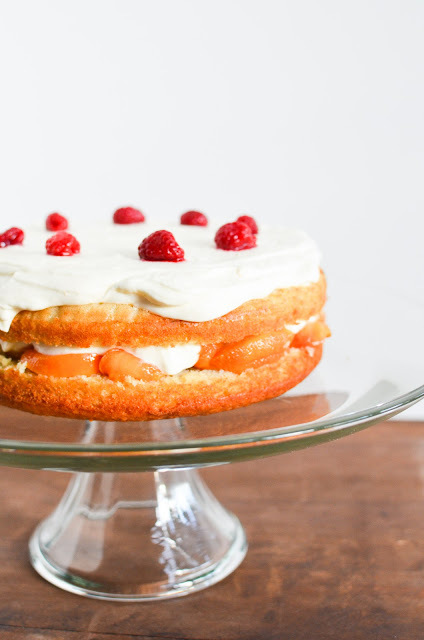 Here, soft and moist vanilla buttermilk cake is layered with peaches and whipped cream and topped with a raspberry sauce. This turned out light and fruity and totally fulfilled my brother's birthday cake dreams. Yay! And as a side note, can I just say how good it is to eat a cake that does not have buttercream frosting all over it? Everyone at the table agreed that this cake really does beat those sugary frosted things hollow. 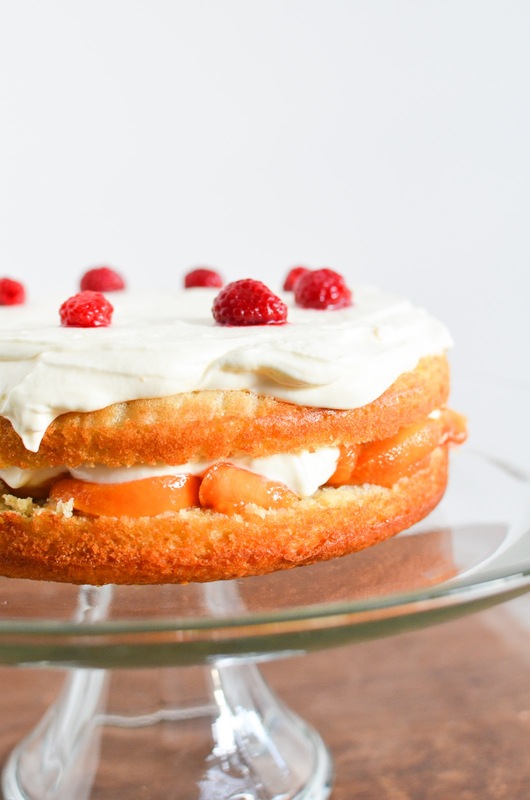 The fluffy peach-scented cream, the peaches and raspberries in beautiful contrast, and the nice soft cake made each bite a delight. So it's time to celebrate! We've got the cake and candles. Light your sparklers and put on your party clothes. You know it's time! I wish you all a joyful and prosperous 2012. Happy New Year! Butter an 8-inch round spring form pan and line the bottom with parchment paper. Set aside. Cream the butter and sugar in a large mixing bowl. Add the eggs one at a time, beating well after each addition and scraping down the sides of the bowl as necessary. Beat in the vanilla and peach juice. In a separate bowl, sift together the flour, baking soda, baking powder, and salt; add flour to the creamed mixture in two additions, alternating with buttermilk. Mix just until each addition has been incorporated, avoiding over-mixing. Divide batter into the prepared pan. Bake in a preheated oven at 350°F until a toothpick inserted in the center comes out clean, about 35 to 40 minutes. Cool the cake in its pan for 15 minutes, then turn out onto the rack, peel off wax paper, and cool completely. To assemble the cake, first trim the domed top off the cake using a long, thin bread knife. Split cake horizontally, then place one half on a serving platter. Arrange peach slices all over, then spread half of the whipped cream filling over. Place the second cake half on top and press gently to bind. 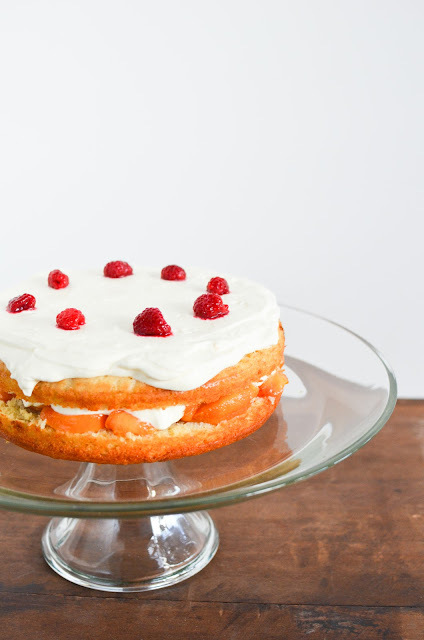 Spread the remaining whipped cream over the top and decorate with whole raspberries. Heat the 1 cup frozen raspberries and sugar until hot and bubbling, then transfer to a serving bowl. Chill cake for 30 minutes, then slice and serve with raspberry sauce. Stir together the gelatin and ¼ cup peach juice in a microwave-safe bowl and let sit until the gelatin is softened. Whisk in the 1 tablespoon superfine sugar and 2 tablespoons peach juice. Heat in microwave until bubbling, whisking to ensure gelatin and sugar have dissolved. Let cool, then whisk in the egg yolk (to cook the yolk, keeping it smooth and fluid without scrambling it). Mix in Cointreau and let gelatin mixture cool, but do not let gelatin harden. In a cold bowl, beat heavy whipping cream until stiff peaks form, and stream in the gelatin mixture and incorporate thoroughly. If cream appears too fluid for spreading on the cake, chill in the refrigerator or freezer, stirring occasionally, until it sets up. *Note: I really liked how soft the peaches were after having been frozen down; they paired perfectly with the softness of the whipped cream. And they released a lot of juice that I used all throughout the recipe. If you don't have fresh peaches that have been frozen down, I recommend using canned peaches that are in their own juices (no extra sugar added). Erica - The cake looks absolutely delicious. Your brother is a lucky guy! My daughter's been baking a cake for everyone's birthday recently, which has been nice. I am so glad we got connected through our blogs and appreciate all your support. Happy New Year to you and your family! Cheers! Wow that looks delicious! I am trying to figure out what to make for my brothers bday. He is not a huge chocolate fan...I don't understand how we are related! I wish I had thought ahead to freeze fruit! Oh well there is a sweet potato cake that caught my eye might try that!